1 day. 3 different ages. A king’s palace. A vampire’s castle. A Teutonic city. It’s Time Travelling time! Leave busy Bucharest behind in a one day trip that you won’t easily forget. First off? Go royal! Step into the shoes of kings & queens and explore Peles Palace – the private retreat of Romania’s royal family. The beautiful mountain scenery and elegant gardens built on terraces add even more charm to this majestic 19th century palace. Inside, everything spells luxury: golden chandeliers, walnut tree carvings, marble fountains, Venetian mirrors, secret chambers, a royal armory and many more. Next, you’ll go even further back in time, during the late middle ages. Myths and legends swirl around the massive Bran castle, a stone giant guarding the passage to Transylvania since the 14th century. Count Dracula vs Prince Vlad the Impaler. Facts vs fiction. Explore the castle, its outdoor village museum or the House of Horrors. The tour’s grand finale? An epic medieval fantasy, started by the Teutonic Knights during their first decades of existence. You’re in the city of Brasov, founded by the knights in 1211 on top of an old Dacian site. Initially called Corona (Latin) or Kronstadt (German), the city is now one of the most visited places in Romania. Dramatically overlooked by Mount Tampa, the city’s well preserved medieval core is a myriad of narrow cobblestone streets, craft guilds, fortified towers, gatehouses or medieval decorated inns. Unveil Romania provided us with a great tour in Transylvania and great company! Our guides, Olivia and Mihai, were extremely kind, helpful, accommodating and knowledgeable. I went with three friends on the day trip to Transylvania and we all loved every second of it! It was an absolute pleasure to spend the day with both Mihai and Olivia, who made our day more fun than we could have imagined. If there is one thing you must do when visiting Romania, it is a tour with Unveil Romania. You will love every second of it! Duration: 12 hours, flexible starting hour (8 AM recommended). Transport: Hotel pick-up/drop-off by private car. A chapter may describe: current attraction, historical events, daily life, fun facts. Peles Palace – one of the finest collections of art in Eastern and Central Europe: over 2000 paintings, Swiss stained glass vitralios, Cordoba leather, Carrara marble statues & fountains, alabaster sculptures, Persian rugs, exotic timbers and solid bronze doors. Architecture: Italian elegance & German aesthetics along Neo Renaissance and Gothic Revival lines. Bran Castle – built in the 13th century by the Transylvanian Saxons to play a strategic military role in the defense against the Ottoman Empire. The fortress was never conquered despite seeing heavy action. 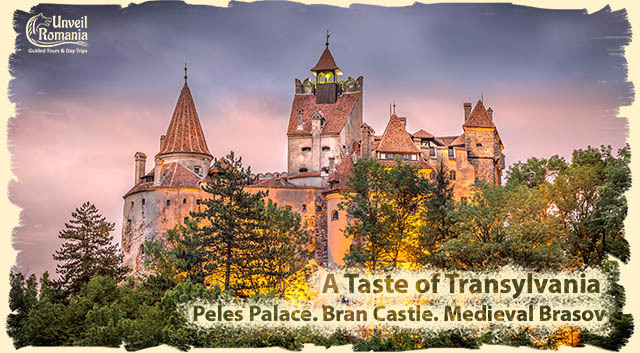 Explore a legendary castle associated with Vlad the Impaler (Dracula) and ruled by Queen Mary. For Dracula fans: enter the House of Horrors or look for souvenirs at the castle’s flee market. Brasov city is a medieval jewel of Transylvania. Its former name (Kronstadt) meant crown city. Stop for lunch/coffee at one of the many beautiful medieval inns, in the heart of the Old Town. When Peles Palace is closed, we will still be able to visit the palace gardens and inner courtyard. Additionally, we may include an extra stop at Rasnov Fortress. 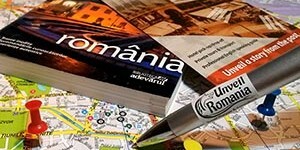 Book this private tour from Bucharest and have A Taste of Transylvania! Step into the shoes of kings & queens, explore the marvels of Transylvania and unveil the myth of Dracula!